Visions of Hell: STH stormwatch : Low pressure area forms in the north Bay of Bengal. 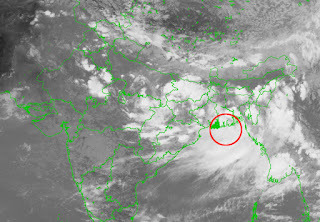 STH stormwatch : Low pressure area forms in the north Bay of Bengal. "Under the influence, the cyclonic circulation over north Bay of Bengal and neighbourhood, a low pressure area has formed over north Bay of Bengal and adjoining coastal areas of Bangladesh and West Bengal"
- Excerpt from the IMD 'All India Weather Summary'.